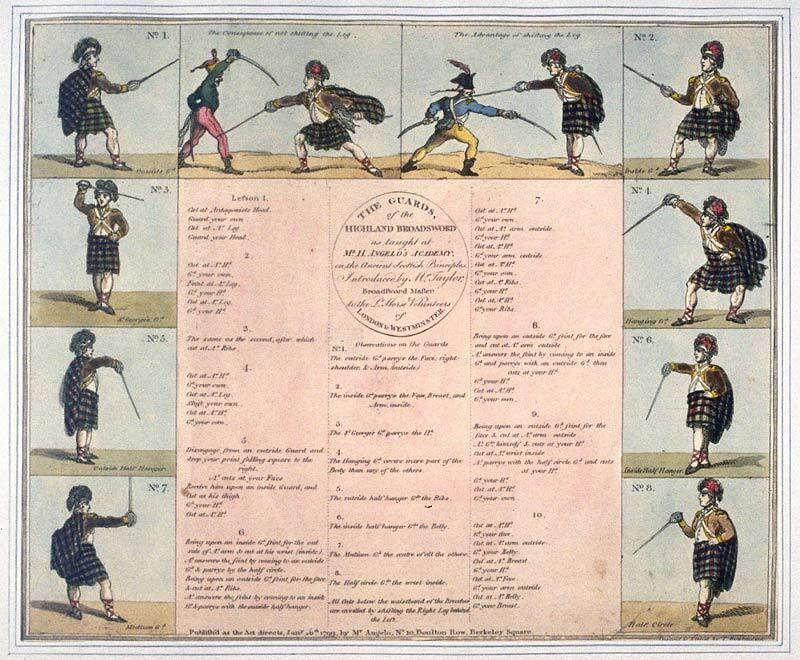 Located in a museum right here in San Francisco is an interesting piece of art called The Guards of the Highland Broadsword, by Thomas Rowlandson, 1799.
Who can share more about this? It's shown below, but a higher resolution version is also available for browsing. There are a couple of those guards that differ from the ones in I:33, but most of it looks very similar. The image at the top demonstrating that any attack to the legs can be avoided and defeated by taking a step back and cutting or thrusting to your opponents head could just about have been lifted from I:33. This is also illustrated in an old book I have: The Art and History of Personal Combat by Arthur Wise 1971, well worth picking up if you can find it. As Martin pointed out, Highland Broadsword by Mark Rector and Paul Wagner shows exactly the same situations and guards. Interesting print! Thanks for sharing, Nathan!